DUAL stands for the conflict between “street art” and “fine” art, between freeway burners and gallery exhibitions, between mass recognition and total anonymity. His bold lines and fresh colors are a break from the everyday monotony of life in the city—a taste of urban subculture, whether you asked for it or not. While one may not have a choice in where and when they encounter a DUAL piece, DUAL leaves it up to the observer to assign a meaning to his work. By operating under a pseudonym, he lets his audience write their own narrative for who he is and the message he is trying to get across. Perhaps best known for his work with wheat paste, particularly since his feature in the 2011 wheat pasting documentary Stick ‘Em Up!, DUAL has never been one to confine himself to a particular medium, background, or context. 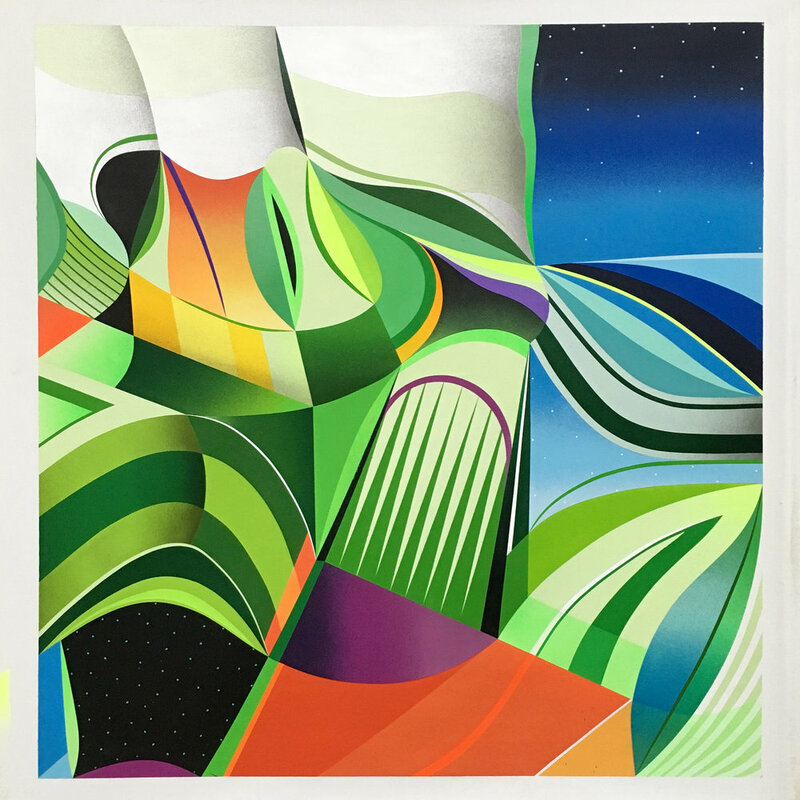 He has been recognized not only for his work with silkscreen and spray paint, but also for his work with lithography and acrylics. Though his obsession with “making marks” stems from his background in graffiti, he has translated that into a passion for creating art. His “art” includes everything from large-scale murals, to paintings on canvas, to meticulously made tape collages, to the forgotten art of sign painting. Dual’s work has evolved from gestural character studies, to more hard edge abstraction with an added exploration of color – creating quite the dichotomy between the “street” artist and the “fine” artist." In addition to being a constant presence on the street and a fixture in the Houston art scene since 2005, DUAL has also pursued a formal arts education and his work has seen more than its fair share of gallery walls. DUAL has been featured in a number of exhibitions by some of the top names in the Houston art scene including M Squared Gallery, Pablo Cardoza, Colton & Farb Gallery and Station Museum of Contemporary Art. He has had the opportunity to collaborate with a number of brands, labels and charities including the Lebron James Family Foundation, Pabst Brewing Company, Boys & Girls Clubs of America, Houston Outlaws, Dickies Workwear, Schmutz Watches, Street Serpents Apparel, and even Sprite. He has also been featured in a number of periodicals including 002 Magazine, Houston Modern Luxury, Houston Press, Free Press Houston, Houston Lifestyle & Homes, Houston Chronicle and Case Magazine and published in books such as Stay Up and Stuck-Up Piece of Crap: From Punk Rock to Contemporary Art.